So it’s been a while since I’ve written here, but things have changed a bit since I’ve been away. For a start, I’ve moved - things finally worked out and my house purchase went through! That means that for a while, I’ve been getting sorted in my new flat with everything that comes with buying your own house. 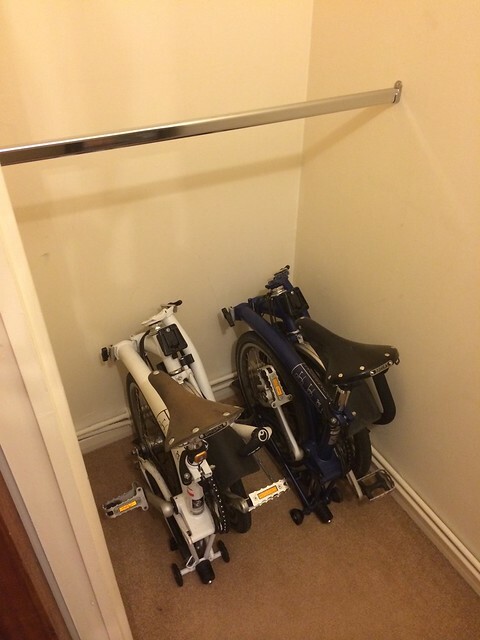 On the plus side, I have a nice new location for the Bromptons! This cupboard already seems to be full of bikes and bike parts! I thought I’d cleared some out when I moved, but it appears enough of it still followed me when I moved. I’m not sure that’ll change, even if I move in with someone else! Anyhow, with the move complete and a few things sorted, I thought it was time to complete a few tasks that needed to be done on the Brompton. Now it’s hit September, the mornings are getting darker (until the clocks change but even then it’ll be darker than it has been) and I’ve been working late occasionally. Which means that I’m returning home in the dark as well. This obviously means that I require lights, not only to comply with the law in the UK but also because I want to remain visible to cars on the road! So earlier in the year, I’d splashed out on a Hope Vision 1 light. This came with rechargeable batteries and works really well - the beam is bright with four different modes (low, medium, high powers and flashing). I’d only used it on the continuous setting as that’s all I ever needed. It performed well, however, it wasn’t that comfortable on the handlebars on the Brompton really. I’ve not seemed to be able to keep it in the same position on the bars over rough terrain. Likewise, it’s a big bulky light and I can’t fold the bike with the light still attached - whilst it’s on a quick release clamp, I still at times forget to take it off, resulting in it colliding with my wheel, sometimes fairly hard - obviously I don’t want to damage my wheel or my light! After some thought, I decided to take the plunge and get one. 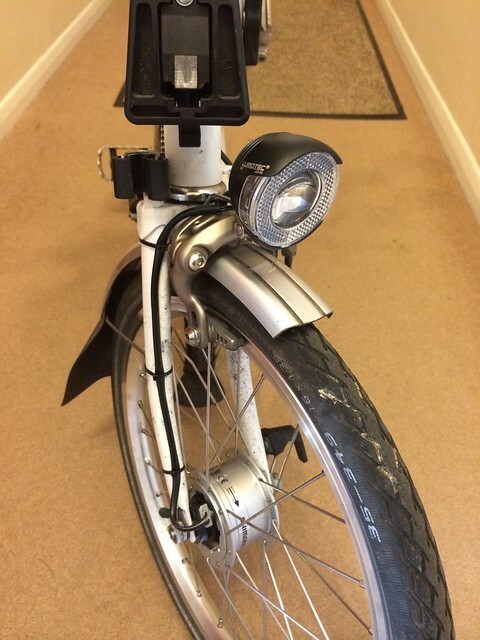 Now, most members of the London Brompton Club recommend the SON hub dynamo and light package that Brompton offer - however, it’s about half the price of a Brompton itself - almost £400 for the whole package! This seemed like a significant amount of money. The cheaper Shimano hub package costs £138 - a fraction of the price. I looked online for reviews of both and downsides of each. The only major downside I could see to the Shimano package was that the light doesn’t have a stand light - so slow and stop and the light goes out (but not the rear one), and that the hub creates more drag. However, both issues I don’t think are major issues for me. The plus points outweighed these (also on the bike, doesn’t prevent the fold, doesn’t need batteries) in my mind. So I ordered these to be fitted at the same time as the parts I needed fitting. This should see me through until next year - though the front brakes are beginning to show wear as well so I might replace these myself at some point with the after market suggestions from the Brompton Club (Swiss Stop are rated highly). I also have a recommendation to change my chain grease - I’d been using an Eco friendly one but it’s quite thick and gloopy and seems to attract the dirt and can cause issues with the chain wear. The dynamo lights I’m happy with - I can’t tell that there’s any additional drag when the lights are on, so currently I feel quite happy with the cheaper option. Time might tell if I come to regret my decision, but currently, I’m quite happy with the purchase. I’ve found that I’ll travel with the lights on more now - I’m quite happy to just flick the switch if I think whether or not I should be using lights because there’s no batteries to charge so there’s no hassle for me or anything to think about later.